Clashes Erupt in Kyiv as Police Raid Protest Camp, Detain 100 - Integration Through Media ....! 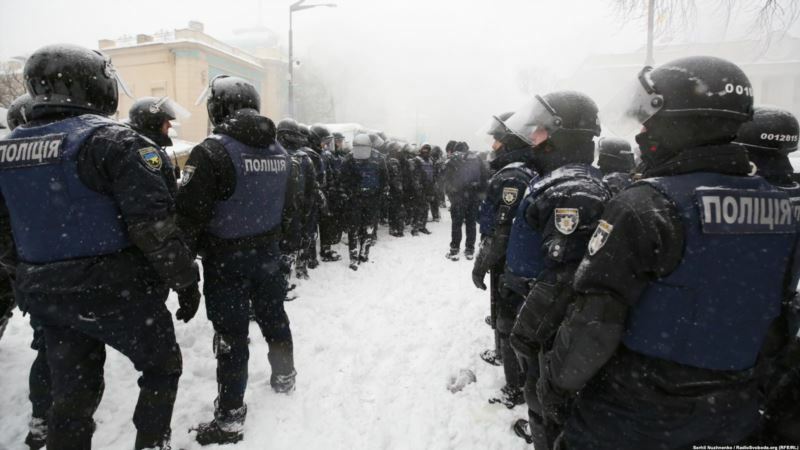 (VOA): Police in Kyiv moved in to dismantle a protest camp near the national parliament building Saturday, detaining about 100 protesters amid clashes. Police said six protesters and four police officers were hurt in the violence near the Verkhovna Rada in the Ukrainian capital. “We have two court decisions to inspect and search this area. … Then communal workers will clean it up,” Andriy Kryshchenko, head of Kyiv police, told reporters at the scene. Authorities said police seized nine grenades, an unspecified number of Molotov cocktails and five smoke bombs during the raid. A reporter covering the event for RFE/RL's Ukrainian service said police used pepper spray against him, even though his press pass was visible. Video uploaded on Facebook showed black smoke billowing into the sky as protesters set alight tires in an area police had cordoned off. ​The tent camp was set up last year by supporters of opposition leader Mikheil Saakashvili, a former Georgian president who was deported to Poland last month. “Police in riot gear approached from two sides and detained almost all the people [in the camp]. Trucks started dragging apart and demolishing the barricades,” lawmaker and Saakasvili ally Yehor Sobolev said. Earlier, Kryshchenko said the police action was part of an investigation into earlier anti-government violence outside parliament in February. Authorities said 14 police officers were injured in clashes on February 27 with anti-government protesters who tried to set car tires on fire near the parliament. Authorities said protesters also threw stones and Molotov cocktails at police. The camp is an offshoot of a broader opposition movement that holds regular peaceful protests in Kyiv demanding the resignation of President Petro Poroshenko over a stalled reform drive.